Today there is a new moon in Pisces. And with the double eclipses happening, it has been quite an emotional doozy of a week! Lots of emotional stuff has been coming up so that we can release it and plant new seeds of what we truly desire in our lives. In order to help you do that, I have a FREE GIFT for you! 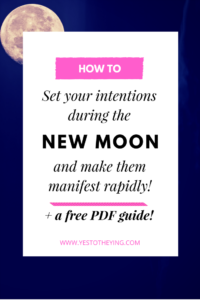 My New Moon wishing guide is newly updated and ready for you to download FOR FREE! Why am I giving it to you for free? Because I truly want to help everyone live happily ever after. Cheesy, I know, but I really believe that you can receive everything that your heart desires, whether that is more money, love, success, or well-being. And you can have it come to you RAPIDLY! Simply click on the image below to grab your free gift! If you are struggling with releasing your blocks or desire guidance from your angels and ancestors, come get a reading from me. CLICK HERE FOR A READING. From my open channel to yours, I send you so much love and light!